Smyth recalled covering the singer’s visit to Cork as part of the ‘Bad’ tour. 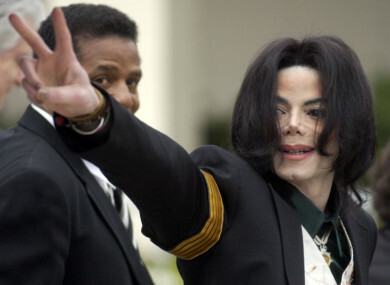 Michael Jackson waves to his supporters as he arrives for his child molestation trial in California in 2005. JOURNALIST SAM SMYTH has described how he had concerns for a child who had a “deeply suspicious” relationship with Michael Jackson in a hotel in 1988. Writing in the Irish Mail on Sunday last week, Smyth recalled covering the singer’s visit to Cork as part of the ‘Bad’ tour. He revealed how James Safechuck, one of the men who as accused Jackson of abusing him in the documentary Leaving Neverland, accompanied the singer to Cork. And speaking on The Ray D’Arcy Show on RTÉ Radio 1 yesterday, Smyth said that he was staying at Jackson’s hotel, where Safechuck was also staying, and that he felt something wasn’t right about their relationship. “I remember thinking at the time… it’s very odd for a man in his 30th year to have his very best friend as this boy called Little Jimmy Safechuck who was 10,” he said. He describes how Safechuck had his own room at Jury’s Hotel, but that it constantly had a ‘do not disturb’ sign on the door and sheeting on the windows to block out views. While those facts themselves didn’t arouse too much suspicion, Smyth said “the whole thing was adding to something very bizarre”. After learning that Safechuck was not attending Jackson’s concert in Pairc Uí Chaoimh and was staying in his bedroom all night, Smyth, along with Eamon Dunphy, decided to write the boy a letter in an attempt to ensure everything was okay. He said the pair gave the note to the porter, along with a “handsome tip”, to put it under Safechuck’s door, but added that they never heard from the child. Despite this, Smyth says he believes the allegations made in the Leaving Neverland documentary. Email “'Deeply suspicious': Sam Smyth and Eamon Dunphy wrote concerned letter to Jackson accuser in 1988”. Feedback on “'Deeply suspicious': Sam Smyth and Eamon Dunphy wrote concerned letter to Jackson accuser in 1988”.